At six feet tall and weighting over three hundred pounds, Diego Rivera caught everyone’s attention when he arrived in Paris at age twenty to study art. People would say he looked like a frog. Frida Kahlo, his second wife, affectionately called him, Carasapo (Frog-face). One of the greatest painters of the twentieth century, Rivera is best known for his murals that often depicts the culture and struggles of the Mexican working class. Rivera was born on December 8, 1886 in Guanajuato, Mexico. He says that, As far back as I can remember, I was drawing. Almost as soon as my fat baby fingers could grasp a pencil, I was marking up walls, doors, and furniture. Throughout his career, Rivera did not shy away from controversy. In 1933, after completing a fresco for the Detroit Institute of Arts, Nelson Rockefeller hired Rivera to create a mural for the RCA Building in New York City. When Diego decided to include the portrait of Vladimir Lenin, the leader of the Communist Party of the Soviet Union, in the mural he was fired. Afraid of the repercussions, Rockefeller had the mural destroyed. Depressed and exhausted, when he heard the news Rivera became ill for a long period of time. Poor health kept me from painting murals for several years. This excellent biography would be perfect to share in a high school art class. It follows Rivera’s career, from his days studying in Europe as he developed his unique style to introducing us to other painters who influenced him. Rubin incorporates quotes, historic black & white photo and detailed views of some of Rivera’s most famous murals, in a thoroughly engaging narrative. Back matter include notes about the history of Mexico as referenced in Rivera’s artwork, Rivera’s artistic influences, where to view works by Rivera, glossary, source notes, bibliography, and index. 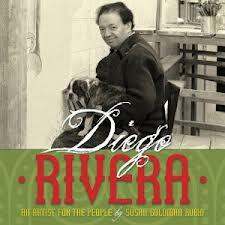 Diego Rivera: an artist for the people is truly a high quality nonfiction title; definitely one of my favorite books of 2013. To learn more about the artist and see other paintings and murals, visit the Diego Rivera website. To watch a short film of Diego and Frida Kahlo, click this link to the San Francisco Museum of Modern Art.